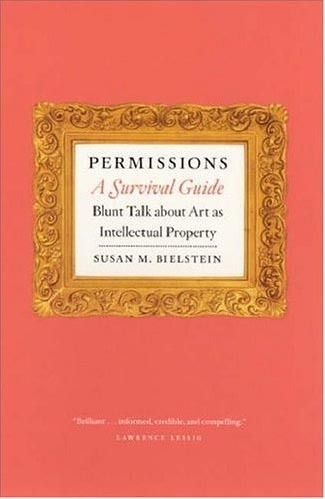 Susan M. Bielstein distills decades of experience as an editor of illustrated books for a guide to navigating the treacherous waters of copyright, Permissions, A Survival Guide: Blunt Talk about Art as Intellectual Property. She gives frank advice on how to determine whether an artwork is copyrighted, how to procure a high-quality reproduction, how to use "fair use" to your advantage, and many other issues. Lawrence Lessig calls it "an extraordinarily compelling account of a system gone mad." 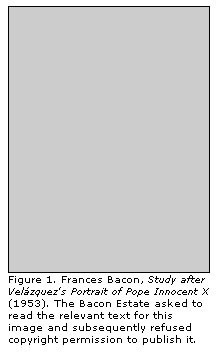 Our excerpt from the book discusses the high cost of permissions for artwork and is lovingly illustrated by the absence of a Francis Bacon painting.